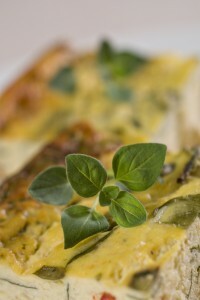 Created for the 2010 Inn to Inn Herb Tour, this savory breakfast dish is a summertime hit at the inn with fresh peppers and oregano from our garden. It’s great for a brunch crowd, too! Heat olive oil in small saute pan and add diced bell pepper. Cook until soft but not browned. Remove pepper from pan and reserve about 2 tablespoons for garnish. Add red onion to the same saute pan and cook onion until soft. Whisk together eggs, ricotta, sour cream, flour, salt, pepper, and Tabasco sauce. Stir in onion, red pepper, 1 ½ cups of grated Italian cheeses, and 3 tablespoons fresh oregano leaves. Wash the spinach well and fold into egg and cheese mixture. Pour into a 12 x 9 inch pan which has been sprayed with pan release. Bake at 350F for 40 minutes, then sprinkle remaining ½ cup of cheese over the top. Return to the oven and bake an additional 10-15 minutes until a knife inserted in the middle comes out clean and the eggs are slightly puffed and browned on top. Cut baked eggs into 12 pieces. Split, toast and butter English muffins. Top muffin halves with baked eggs and garnish with reserved peppers and oregano.